Elizabeth Warren knows how to spend money. Mr. Voight’s health insurance premiums skyrocketed this year, and he’s struggling to pay all of his bills. He knows better than most how hard it is to get by without a COLA. It’s a tough year for him, but not for CEOs at the biggest companies in the country. Instead of an unexpected increase in health insurance cost, the average CEO at one of the top 350 American companies saw their $16 million salary grow by more than $600,000. That loophole is in a law that was once described by a former Republican Chairman of the Senate Finance Committee Chairman as having “more holes than Swiss cheese,” and today it costs taxpayers about $5 billion dollars every year. But we can change that law — and we can put the tax dollars saved to work helping Mr. Voigt and millions around the country like him. By eliminating the performance pay tax loophole, we could pay for a 3.9 percent or about $580, one-time benefit boost — the same percentage top CEOs saw their salaries grow in 2014 — for those who have been denied their COLA this year. Our SAVE Benefits Act would do just that. It would give 70 million Americans — seniors, veterans, children and more — a desperately-needed boost to their finances, and it wouldn’t cost taxpayers a single penny. Closing this loophole even leaves enough revenue left over to help extend the life of the Social Security trust fund. Once again those who profess to demand fairness cannot be fair in making their case for anything. The “loophole” she talks about refers to a tax provision that limits a corporations tax deduction for executive compensation unless the compensation is performance based and therefore at risk. First, that $16 million salary she talks about is not salary, but total compensation which includes bonuses, deferred compensation, stock awards and the future value of any pension and that compensation can vary greatly from year to year. By the way that huge salary bump is 3.75%, far less in terms of actual salary. She says the loophole she wants to close costs taxpayers $5 billion a year. She then says closing the loophole will pay a 3.9% boost in Social Security or about $580. According to the latest Social Security Trustees report, the system paid $706.8 billion in benefits in 2014. 3.9% of that is over $27 billion; a far cry from $5 billion, so Sen. Warren is either very bad at math or hasn’t given us all the details, like giving the one time boost in Social Security costs over five years of future loophole savings which as I said are not guaranteed, but variable. She doesn’t say where the $27 billion comes from during those five years. Her logic of a benefit increase not costing taxpayers a single penny is typical. If closing the so-called loophole is valid, so is using the additional revenue to reduce the debt, interest on which is costing taxpayers quite a few pennies. Never mind looking at the economic big picture, long-term consequences; just ignore strategic thinking. None of that matters when you are a liberal ideologue. If the current COLA is not accurate or fair, then instead of playing games with the tax code, fix the COLA formula and find a way to permanently pay for a change, but you see that requires more work than finding a new scapegoat. P.S. There are probably a lot of other Americans who could use a 3.9% raise too. I happen to think young families deserve as much consideration as seniors, veterans and the disabled. I’m old, I’m a veteran; why does that make me special? Politicians throw around hot button buzz words that appeal to the masses, but are counterproductive for society as a whole. 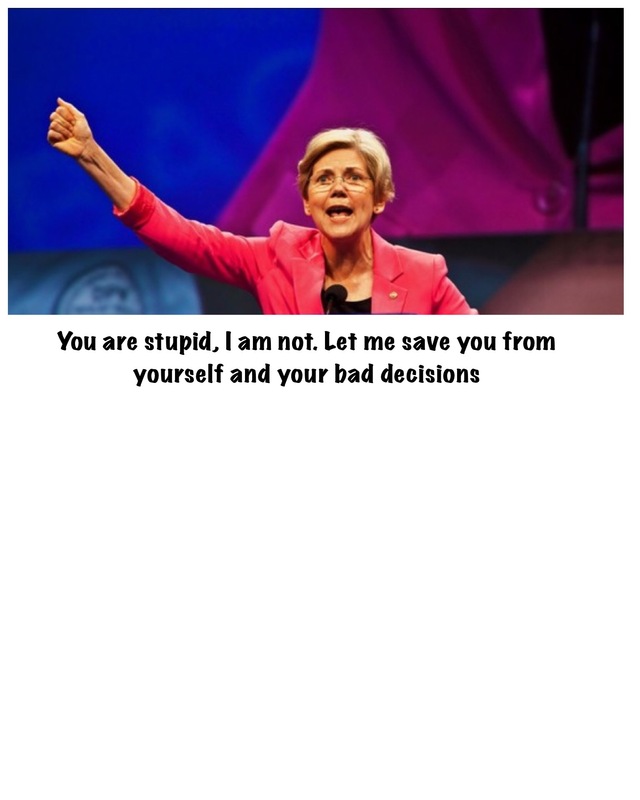 People who think like Sen. Warren only see things one way. Justify what you want to do by taking from those who are productive and give to the unproductive. Making everyone poorer. She does not know or care that when Walmart’s costs go up, the prices they charge in their stores go up. So, the help she thinks she is providing by this tax policy change, costs everyone. There should be a law against her stupidity. She fails to note, of course, that the SS COLA applies to these same CEOs once they retire. She ignores the dramatic burdens we have already placed on children and grandchildren – by approving increases in benefits to the greatest generation (and the Baby Boomers to follow) – benefits that we Baby Boomers and our parents never paid for (as a group) – everything from the COLA changes in 1977 (Carter) to the Medicare Part D giveaway (Bush II). My point is that those who are receiving SS today did not fully earn it, did not fully fund it. We have a deficit of over $100 Trillion on an indefinite basis. So, the COLA fix, if there is to be one, has to be part of a larger fix. It is not as if Social Security is “just right, but for the COLA”. Justifying Social Security increases is easy – if you have the money. I think of Rosie the beagle, my deceased friend, who would eat everything and anything in sight – if you let her. Again, Warren uses Social Security for ulterior purposes, claims “you earned it” or “you deserved it”, as a justification for her tax policies. The point here is that the benefit is one time, the tax is forever, and of uncertain future. Yes, the cost is 4% of maybe $600 of the $700 billion paid in Social Security, or $24B. The revenue is likely to be closer to $3B a year, but for many years. The revenues are targeted to the trust funds – half to income, half to social security disability, so, despite the short term deficit while this is being funded, Democrats have another option to claim that Social Security is really not in distress, and that no structural change needs to be made at this time; or, more likely, that all that needs to be done are more and more changes like this, so “people pay their fair share”. Finally, and importantly, elimination of this tax preference will not cause the CEO to pay more in taxes. It will simply raise the net after-tax cost to pay executives. When corporations end up having higher cost to deliver the same benefit, they will look for savings elsewhere – that often means limits on other people’s compensation. Take the CEO who makes $16MM in her example, who received a $600k raise. The tax would apply to the corporation – not the executive. It affects corporate deductibility. So, what’s a corporation to do? Expect to see employers reshape total rewards to reduce current direct compensation and create an explosion in Supplemental Executive Retirement Plans which pay out benefits after the executive has retired. Those added benefits are not tax deductible. However, once terminated, the $1MM limit does not apply. And, expect to see corporations lower spend elsewhere – on other workers pay. Corporations in a tax paying status probably pay a marginal rate of about 35% or so. Take that $16MM in compensation, and $15MM exceeds the $1MM limit on tax deductibility – apply 35% and you get about $5MM in new taxes. Remember, most CEOs earn less than $1MM – so it will only apply to a couple hundred, maybe a couple thousand individuals. And,while many other executives at jumbo firms earned over $1MM, it is a significant tax on a relatively small number of individuals. She’s a fool, she is envious, and she is dangerously uninformed about how the real world works outside the beltway. Or, worse, she is not a fool, she is not envious, she does know and she couldn’t care less. And she was a significantly overpaid academic.